The Trust sponsors an annual lecture in development economics at Stewart’s Melville College (previously Daniel Stewart’s and Melville College or DSMC), Queensferry Road, Edinburgh. All lectures are held at the college. If you are not a student or staff member at Stewart’s Melville College and you would like to attend the next lecture, please contact us. Since March 2014, Thuy-Binh Nguyen has served as manager on a Climate Change Adaptation project in northern Uganda. She will speak about her expriences on this project and will use them as the basis of a discussion of the contrast between typical expectations of such development aid and its reality, and of the potential of humanitarian aid more generally, in settings such as rural Uganda. In this lecture Mr de la Mare explained, with video clips, how the FT is using video and other new media such as blogs and graphics to tell the big stories in economics, finance, politics and business, from the annual Davos gathering of policymakers and business people to the problems of corruption in Malawi and its devastating impact on health provision. He will also talk about how he ended up as a video journalist, having started out in the Labour Party and OXERA, the economic consultancy he worked in with Phil Gray. The term poverty readily brings to mind images of hunger and destitution in the developing world. At the same time, in 2013 one in four young people in Scotland are classified as living in poverty. How do we reconcile the concept of poverty in the developing world with the reality of poverty in our own communities here in Scotland? John attended Daniel Stewart’s and Melville College from 1973-1986. He then graduated MA (Hons) in Economics from Aberdeen University in 1990 and embarked upon a career in business. In 1998 he took a one year MBA at Cambridge University and then moved to London to work in the technology and telecoms industry. Since returning to Edinburgh in 2007 John has combined a working career in technology investments with work in the charitable sector. His particular interests are supporting young people from tough social backgrounds in Scotland and the development of education in Burma. 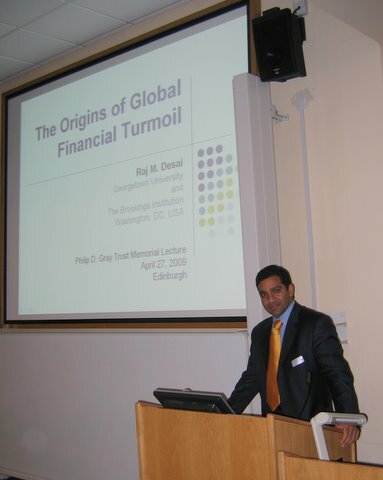 This talk looked at some trends in global economics as perceived by international business leaders, some of the social and human scale aspects of globalisation and describe the work of the trust in this context. Finally, a link will be made to Scotland to set the scene for the next lecture in the series. Anil was a pupil at DSMC between 1980 and 1986, in Tay House. After school, he studied Land Economy at Aberdeen University then moved to London where he worked for a major international property investment and development company for three years. He then changed direction and went back to university, this time to Nottingham, where he studied law. Anil qualified as a lawyer in 1997 and since then received a Masters in Law at Kings College London. 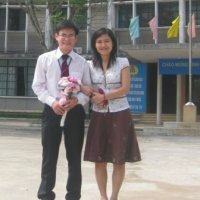 He has lived in China, Hong Kong and most recently Abu Dhabi where he currently lives with his wife and three young children. Most of his legal career has been with Allen & Overy, a major global law firm – with the exception of two years in which he worked as Deputy General Counsel of the Olympic Delivery Authority in London. He specialises in advising governments, investors and funders on infrastructure projects in the sports, power & water, transport and education sectors. Anil is a trustee of the Philip David Gray Memorial Trust. First Part: How much and where does it go? What IDA contributes to Vietnam – financially – and thus by implication how much the UK contributes to Vietnam directly and indirectly. Second Part: How much goes into the energy sector? Third Part: What do we get for it? Richard Spencer has been with the World Bank for fourteen years, during much of which he has worked on renewable energy projects. He worked on World Bank projects in China from 1996 – 2006. Resident in Hanoi since 2005, he is now responsible for the World Bank’s program of assistance for energy in Vietnam, which consists of a portfolio of about $1 billion in investments and ten or so separate advisory tasks, including power sector reform, renewable energy, energy efficiency, large hydropower, rural electrification and power transmission. He has worked on energy sector development in Africa, the Middle East and Latin America. Before taking up his position at the World Bank, he managed parts of the UK’s energy efficiency, renewable energy and clean coal technology programs. This talk addressed the causes, development and consequences of the financial catastrophe that began in 2007-2008. Mr Rohland discussed what has distinguished Vietnam’s development experience over the last 20 years from many other countries, what the World Bank contributed to it and, more importantly, what the World Bank learned from for its own approach to development. Klaus Rohland is currently the World Bank’s Country Director for China, Mongolia and Korea in the East Asia and Pacific Region, based in Beijing. From November 2002 to March 2007 Mr Rohland was Country Director for the World Bank in Vietnam. There, Rohland oversaw the implementation of the World Bank’s largest concessional lending program in the world and led a large scale advisory program.